Joseph Smith Jr. established the Mormon Church, also known as The Church of Jesus Christ of the Latter Day Saints, on April 6, 1830, in Seneca County, New York. During the early 1820s, Smith claimed that an angel, Moroni, visited him and gave him gold plates. Smith translated these plates into English and published his translation as the Book of Mormon in 1830. The Book of Mormon describes the migration of the lost tribe of Israel to North America. According to Smith, descendants of Manasseh left Jerusalem circa 600 BCE. In 588 BCE, the son of Zedekiah and his followers left Jerusalem to establish a new colony. Eventually these two different groups united together and lived in harmony in North America. These people eventually split into two groups, the Nephites and the Lamanites. Following Jesus Christ's resurrection, Christ visited these two groups, and they lived in harmony for two centuries. Warfare eventually erupted, and by 400 CE, the Nephites no longer existed. The Lamanites, according to Smith, were ancestors of the Native Americans. Mormons believe in God the Father, Jesus Christ, and the Holy Spirit, but worship them as separate and distinct beings, as opposed to Trinitarian Christian denominations. They accept the Bible as God's true word, but they also believe that the Book of Mormon documents Jesus Christ's presence in North America. For Mormons, both the Bible and the Book of Mormon are legitimate documentations of God's word. The Mormon faith is relatively democratic, with all people enjoying the right to approach God. Mormons also believe in doing good works and helping people less fortunate than they are. In 1831, Smith and his followers, at the urging of Campbellite Sidney Rigdon, moved to Kirtland, Ohio. In 1833, the Mormons began to construct a church in Kirtland. Numerous Ohioans, perhaps as many as twenty-five thousand people, converted to Mormonism. As the Mormons' numbers increased, many Ohioans became fearful of this group's increasing power. Many non-Mormons opposed the Mormons' practice of owning land communally. Rumors also circulated that the Mormons engaged in polygamy. In 1838, Smith and many of his followers, facing growing hostility from other Ohioans, moved westward. The Mormons eventually settled in Carthage, Illinois, where a mob killed Smith on June 27, 1844. The Mormons then moved further west, eventually settling along the Great Salt Lake in modern-day Utah. The Mormons who remained behind in Ohio eventually affiliated themselves with the Reorganized Church of Jesus Christ of the Latter Day Saints. This group claims to be the true followers of Smith's teachings. 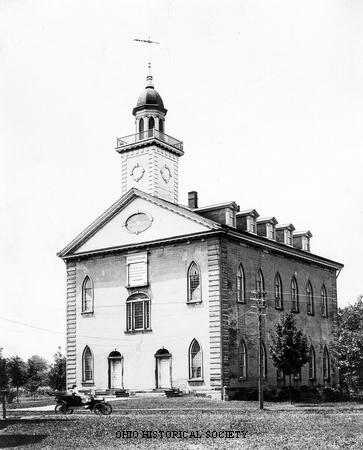 Numerous religious groups, including the Mormons, the Campbellites, and the Millerites, sought religious freedom in Ohio during the first half of the nineteenth century. While all of these groups faced some intolerance, most Ohioans initially accepted these various religious faiths. As their numbers increased, other Ohioans felt threatened by their increasing economic, political, and social power. Although many people looked to Ohio to provide themselves with a better life, not all people succeeded in attaining their dreams.